A young man visits a lady in her middle-age. They engage in small talk with the boy exuding nervous energy. The boy reveals his identity and his father's name to the lady. She instantly recognises the man to be her son, whom she had left when he was just 5 years old. The young man questions his mother for the reasons she had left him. The mother cooks up a story, saying that his father had killed all her singing aspirations, was a sadist and behaved very badly with her. She adds that she left the father because she could not bear the brutal treatment JUST because she was an Indian girl. The son loses his temper and tells his mother that he knows that she was forced to leave his father because she had been impregnated by his father's best friend. 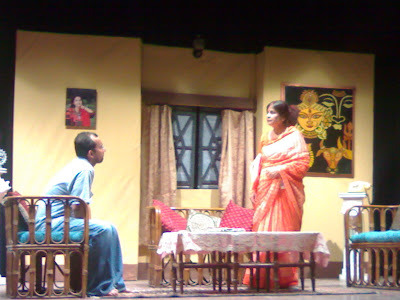 The play ended with the son leaving his mother crying with tears of guilt that promise to ruin her life for all times to come. It was not a happy story that I usually enjoy. But I was really impressed with the actors. The Son was excellent in projecting the anguish of a child, who was abandoned by his mother and had faced the hardships of life answering difficult questions about his own mother. The Mother on her part, was exceptional in adorning the role of a woman who made a choice earlier in life, a choice that makes her guilty but at the same time the good things that come with this new life are worth forgetting the injustice she met out to her son. I had goosebumps after watching her express remorse at the end of the play. me being an actress it's very interesting to hear about theatre from your part of the world. very interesting story, unlike one you can see in b&h. That makes an interesting story and if the actors were good, as you suggest, then it would probably keep everyone glued to the performance. Nice photo of the actors. It sounds like it would make a very dramatic movie. Thanks for sharing it with us. Wow great to know that you are an actress. Would love to see your play some day. It was actually a very nice performance. The storyline was depressing though but it kept everyone zapped. Even I had the same thought in fact I had written half the sreenplay in my mind while watching the play itself. The theme of the play is nice and the way u have reproduced the story here is also impressive. although, such a play doesnt leave u with a good mood but it lets u introspect about the kind of choices you ought to make in life, so as to have least regrets.